This week I am going to stray from the normal Nats discussion and do something different, inspired by one of my favorite players to watch. His name is Rich Garces, and he was a pitcher who spent his early career moving up and down, but settled in with the Boston Red Sox and ended up in their bullpen for 7 seasons. What was notable about him was his ability to get hitters out, and his rotundity. He is listed on his baseball reference page at 250 pounds, but that ma y be generous. Also notable was his nickname, El Guapo, which was not only the villain in the movie Three Amigos, it means “The Handsome One” in Spanish. Regardless, despite being non-athletic in stature, he was an effective reliever for many seasons, and was very much a fan favorite. So here, in tribute to him, I name the Rich Garces All Stars. It is a list of current players who could give El Guapo a run for his money, even if running isn’t really their strong suit. The rules here are that they have to be current players, and they have to be decent. I’m not plugging someone into a spot just because they’re big. These are plus sized players who can really play, and mock them if you want, they’re making millions as professional athletes. I’ve listed my choice, by position, and given what ESPN has as their height and weight. C – Ramon Castro – 6’3″, 258 lbs – The Mets have had close to a half a dozen catchers on their roster or DL since October, but none have the size of Ramon Castro. Castro, the first Puerto Rican player ever to be drafted in the first round, has been a good defensive catcher all his career, but last year with the Mets he really shined, hitting .285/.331/.556. His one career SB also came as a member of the Mets, and while a strained hamstring has kept him on the DL so far this season, he is probably going to jump to the number 2 spot on the depth chart once he is healthy. 1B – Prince Fielder – 5’11”, 270lbs – While there are many other than could ha ve been a good choice at this position, I had to go with the man who led the NL in dingers last season. Also, his 50 HRs made him the youngest player ever in MLB history to hit 50 or more. But he’s not just a big guy with pop. He hit .288/.395/.618 last season, and after a slow start this year, he’s been putting over similar numbers over the last 2 weeks. He also is a gifted first baseman who has a range above league average, and moves much better than you would expect for someone heavier than most NFL linebackers. Fielder has decided to become a vegetarian, but not because of his own large size, rather due to his aversion to animal cruelty, and thankfully so far this has yet to affect his size or his power. 2B – Ronnie Belliard – 5’10”, 214 lbs. – As middle infielders are normally a small, spry group, there aren’t too many that are up there in El Guapo territory. Ronnie Belliard, “the Belly”, has played second base with a good bat for 11 seasons in the majors without ever being considered small or spry. In those 11 seasons he’s been a very consistent hitter with an AVG of .273, and has a World Series ring with the Cardinals. While his range may be questioned, his leadership and his ability to inspire his teammates are not – both the Nationals and the Dominican Winter League team the Licey Tigers, on which he is a staple, value him for that above all else. 3B – Miguel Cabrera – 6’4″, 240 lbs – His days at third are clearly numbered, but it’s because of his hefty frame that he will likely move to a more sedentary position, so he definitely belongs on this list. A superstar at 25, if he was anywhere but stranded down in Miami for the last few years he might be one of the most recognizable athletes in the game. What has he done in his 5 seasons? He’s got impressive career splits of .310/.386/.539, is a 4 time all star, 2 time silver slugger, he’s the 3rd youngest player to reach 500 RBIs (behind Ted Williams and Mel Ott) and already has a World Series ring. An interesting fact about Miguel – unlike Brad Nowell of Sublime, he practices Santeria, a New World religion with West African roots, and possibly has a crystal ball. SS – Jhonny Peralta – 6’1″, 210 lbs – Jhonny isn’t exactly huge for this list, but middle infielders, especially shortstops, are traditionally a tiny bunch. Jhonny is bigger than most at this position, but he’s actually not that big. He also uses his size to his advantage, hitting 24 HRs in 2005 and 21 in 2007. He’s already got 4 this season, and he hasn’t really gotten on pace with his bat yet, so I’m expecting more. His range is pretty decent for the position, putting more svelte shortstops to shame. LF – Dmitri Young – 6’2, 298 lbs – Ok, I tried, but I couldn’t go through this whole thing without mentioning Dmitri. He’s spent enough time in LF, and while it’s been a while, there is speculation that if Nick Johnson stays healthy all year, Dmitri will get some amount of time out there again. In the field he moves about as well as you’d expect from someone his size. But, after a disappointing and injury-plagued 2006 fraught with all sorts of legal issues, Da Meat Hook came back big time in 2007 hitting .320/.378/.491, better even than his impressive career average of .292/.349/.477, and proving that this big man can still hit. He also parlayed that impressive season into a two year deal with the Nats where the management hopes he can teach the young, sometimes troubled, prospects that when you mature enough to play without having those problems, success comes much easier. CF – Andruw Jones – 6′ 1″, 240 lbs – To give you perspective on where he came from, Baseball Reference says he weighs 170 lbs, which was clearly a long time ago. TJ Simers of the LA Times says he weighed in at 248 the other day, and I am not surprised that it has gone up. After all, many people deal with stress by eating. He isn’t hitting well with his new team. But his career has been exceptional so far, a regular since he was 19 years old (the age he hit 2 HRs in his first 2 World Series ABs), Andruw has 7 seasons of 30 or more HRs, and a career total of 369, with splits of .261/.341/.494, all while being considered one of the best fielding CFs playing. Give him some time, and the man Simers called the “tubbo in center” may get back some of his old hitting abilities. RF – Matt Stairs – 5’9″, 210 lbs – Stairs isn’t the biggest guy on this list, but he’s certainly the most experienced. At 40 years old, the man nicknamed “The Professional Hitter” has basically become a platoon hitter against righties, which he hit .288/.364/.567 against in 2007. He’s already hit 4 HRs against them this season. Still very effective at mashing RH pitchers at age 40 (.325/.360/.513 vs RHP in 2008), he could be in the majors another 5 years. Toronto is Stairs’ 10th major league team, and at 245 HRs, he ranks second all time among Canadian-born players. His lack of speed is well known and his lack of range in the outfield is understood, but his strong throwing arm and his ability to hit keeps him out there. DH – David Ortiz – 6’4″, 230 lbs – His resemblance to Cookie Monster notwithstanding, Big Papi is a big man with big power, and likely weighs a bit more than the 230 listed. After leaving Minnesota as a platoon player, he emerged in Boston to become one of the most feared hitters in the game. He was probably the hitter a pitcher would least like to pitch to from ’04-’06, and is definitely still high on the list. He hit 208 HRs in his 5 seasons with the Sox, and many of them seemed to be late in close game, as evidenced by being the first player to hit 2 walk off HRs in the same postseason (2004). He holds the Boston record for most HRs in a season (54), has been top 5 in MVP voting 5 times, and has been a key part of turning the Red Sox from lovable losers into something very different. SP – CC Sabathia – 6’7″, 290 lbs – Big and strong may be a good way to describe CC, as he’s pitched 180 innings or more in all 7 of his major league seasons so far, starting when he was 20 years old. He is coming of a pretty good year, one in which he stuck out 209 while walking only 39, racked up 19 wins, and won the Cy Young. This year, his 8th, started out poorly, but he recovered in 2 of his last 3 starts to throw have the lines: 6 IP, 11 K, 0 ER and then 8 IP, 8 K, 1 ER. If he continues to pitch as he has for the previous 7 years, at only 27 he has the opportunity to sign one of the richest contracts in baseball history this offseasons. Like they say in that Wendy’s commercial – that’s over 100 million junior bacon cheeseburgers! LOOGY – Ray King – 6’1″, 240 lbs – Have it Your Ray. The man who wears a shirt with a Burger King logo (except it says Ray King, and I’m not making that up) in the locker room isn’t afraid to put down a few burgers. Over his career, his righty/lefty splits are in batting average against are .279/.214. Since 2005, righties have hit more like .350 against him, but he is still quite effective against lefties. He has some terrific season against them recently, holding them to averages of .150 in ’04, .244 in ’05, .187 in ’07 and .235 in ’08. The rest of his game isn’t what it used to be. Watching him pitch the other night, I saw a runner steal two consecutive bases on him without him batting an eye. But try to steal a sandwich from him, and you might be in trouble. In actuality, Ray has lost some weight, an offseason diet program had him drop 23 lbs, which is what’s best for his overall health. Unfortunately for him, he was recently optioned to AAA. As effective as he is against lefties, he’ll be back in DC or somewhere in the majors soon enough. Setup – Jonathan Broxton – 6’4″, 290 lbs – 290 lbs is a nice complement to his 100+ mph fastball, Broxton is a great setup man and is considered next in line for closer with the Dodgers. So far, going into his 3rd full season, he’s struck out 237 hitters in 186 innings while only walking 76. He looks like he can fill the role as adequately as he can fill a seat. Mark Grace once referred to him as “The Biggest Man Alive” and I’m sure watching him bear down on you from the pitchers mound would make that nickname feel pretty accurate. I’m waiting for someone to charge the mound when he’s standing up there. 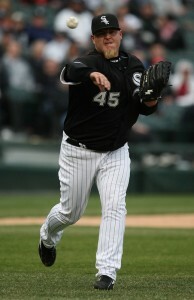 Closer – Bobby Jenks – 6’3″, 273 lbs – Jenks’ career has bee n impressive so far, he was called up from AA in July 2005 and became the full time closer for the White Sox in September. It worked out well for him, as he earned 2 saves in the World Series, and was the first rookie to close out the Fall Classic. The last two seasons he has saved 41 and 40 games, respectively, and with his career K/BB ratio of 192/64, it’s likely that hitters are much more intimidated by his fastball than his size. In 2007 he tied the record for most consecutive batters retired at 41, making him perfect in 14 straight appearances. Most importantly, Ozzie Guillen signaled for Jenks to come out of the bullpen by holding BOTH arms out wide, saying he didn’t want the righty or the lefty, he wanted the big guy. Oh yeah, he’s also the Chicago area spokesman for the McGriddle sandwich. Next time, we’ll move on from the big guys to the little ones… in the meantime, let me know if there is somebody I missed here, perhaps a replacement for one of the guys I picked? If you’ve got someone in mind, post a comment.